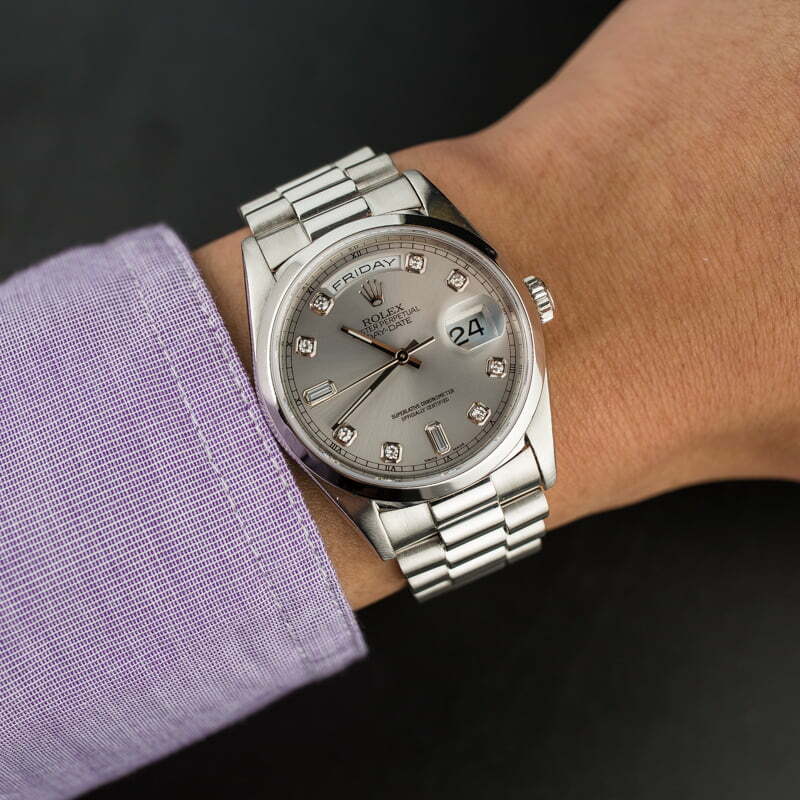 Whether the Oyster Perpetual, the Datejust, the Day-Date, the Daytona, the Yacht-Master or other models, the classic designs of Rolex watches lend themselves well to his and her pairings. This is especially true now since not only does Rolex offer more sizes within certain collections but also, women are completely comfortable wearing larger watches once considered as men’s sizes. Here is a pair of platinum Rolex President watches to satisfy anyone’s needs. The Day-Date is an incredible watch. Get a match pair for your significant other. When it comes to precious metal Rolex watches, it doesn’t get more prestigious than a platinum one. And what better way to wear platinum than on Rolex’s most famous status watch? The Rolex Day-Date ref. 18206 sports a classic 36 mm Oyster case fashioned from 950 platinum. In case you thought this white metal could be confused with stainless steel or white gold, Rolex has key design details to differentiate between these materials. For instance, Day-Date watches are exclusively crafted in precious metals, never stainless steel. Furthermore, white gold Rolex dress watches are always equipped with fluted bezels and never smooth ones. Then there are the oddities like the Rolex Day-Date Tridor, but that is for another day. This particular Rolex Day-Date ref. 18206 houses a coordinating silver dial and for added luxuriousness, the hour markers are indeed diamond ones. Although diamond men’s watches aren’t to everyone’s taste, diamond indices on a silver dial are a tasteful and discreet way to wear them. Naturally, the ten gems make way for the famed duo of calendar windows—day at 12 o’clock and date at 3 o’clock—after which the watch is named after. These look great if it is from Rolex, otherwise, steer the other direction when it comes to custom diamond dials. While the Day-Date’s official moniker takes after the calendar apertures on the dial, the watch’s famous “President” nickname is thanks to its bracelet. Characterized by its semi-circular links, the President bracelet made its debut on the first Day-Date watch in 1956 and has remained an integral design element of the Rolex President watch since. As expected, the President bracelet of the Day-Date ref. 18206 is especially hefty due to the weight of platinum. Make no mistake, a platinum Rolex watch makes its presence felt on the wrist. While the watch is a Datejust, it still perfectly matches with the men’s watch mentioned above. Among the wildly diverse women’s Datejust collection, there are a special set of watches labeled as ladies’ Rolex President watches. These especially luxurious ladies Datejust dress watches are constructed from precious metals and are fitted with the coveted President bracelet. The platinum Rolex Datejust ref. 179296 is an especially gorgeous example of a ladies President watch with an elegant 26 mm Oyster case and diamond pavé lugs. The ice blue dial also shines bright with ten diamond indexes. It’s worth noting that ice blue is a dial color reserved only for platinum Rolex watches. Since this is a Datejust, on the dial is also the date window at 3 o’clock along with the essential protruding Cyclops magnification lens on the sapphire crystal. Completing the look of the Datejust ref. 179296 is the full platinum Rolex President bracelet, which wears like a piece of fine jewelry around the wrist. If you’re looking for a set of his and her luxury timepieces to declare your love for each other and an appreciation of fine watches, then make a serious style statement with matching platinum Rolex Presidents.